While a thigh gap is certainly no indication of good health, it can help any women achieve the slimmer physique she has always wanted. Developing a thigh gap requires you to lose excess fat on the thighs which causes a noticeable gap to form in between the legs. As the numbers on the scale go down, you’re likely to see your thigh gap grow. Safe fat removal on the thigh area can be accomplished without resorting to highly-restrictive diets or overly-intense exercise routines. To get a supermodel-like gap between your thighs, try these effective fat reduction treatments. Healthy Diet – Cut Carbs and Skip Processed Foods! You might be able to achieve a thigh gap with various quick-result tips. However, to maintain your gap you must eat a healthy diet and exercise regularly. Steer clear of processed treats and munch on veggies, fruits, greek yogurts, and other low sugar, low calorie foods. Cut carbohydrates by replacing your carb cravings with healthy alternatives such as proteins or veggies. For example, instead of a piece of bread enjoy a hard-boiled egg or instead of eating rice try minced cauliflower as a substitute. When it comes to exercise, cardio is key. High activity cardio burns extra fat on the body while toning the leg muscles. While there’s no one-size-fits-all approach to exercise, opt for high-intensity workouts designed to burn fat, such as interval training. Do cardios that directly use your legs. Among good options are power walks, long distance running, jumping rope and other aerobic exercises that build strong muscles while burning fat. But it’s important to remember that having a thigh gap also depends on a person’s bone structures. For some, no matter how in shape or fit they may get, they may never achieve a thigh gap due to their genetics and body shape. Nevertheless, improving your overall health by living an active lifestyle will still make you feel stronger, happier and more vibrant. Want to know how to lose body fat faster than with traditional diet and exercise? Try Exilis. This device is safe and effective to reduce fat and tighten the skin at the same time. This exciting new technology uses US FDA-cleared radiofrequency (RF) energy to achieve body contouring and skin tightening. During Exilis treatment, radiofrequency waves are used to heat the deeper layers of skin. This heat causes fat cells to gradually shrink and the surrounding skin tissue to contract. In turn, new collagen production is stimulated leaving you with tighter skin with less underlying fat. While you may experience a deep heating sensation during Exilis, the procedure is considered to be nearly pain-free due to the cooling applicator. Want another fat removal technique that works to eliminate stubborn fat on the thighs? Try the Cutis Fire and Ice treatment. At the Cutis Aesthetic Clinic, Dr. Sylvia Ramirez combines BTL Vanquish Flex with the CoolSculpting CoolFit applicator to provide skin tightening and fat reduction benefits in the thighs. This combination treatment may be considered as a nonsurgical liposuction or a safe alternative for individuals who wants to eliminate stubborn fat without the risks and recovery time of surgery. CoolSculpting in Singapore is a fat freezing procedure that uses controlled cooling to freeze stubborn fat resistant to diet and exercise. This FDA-approved procedure is great for removing the fat bulges in your inner thighs responsible for filling your thigh gap. 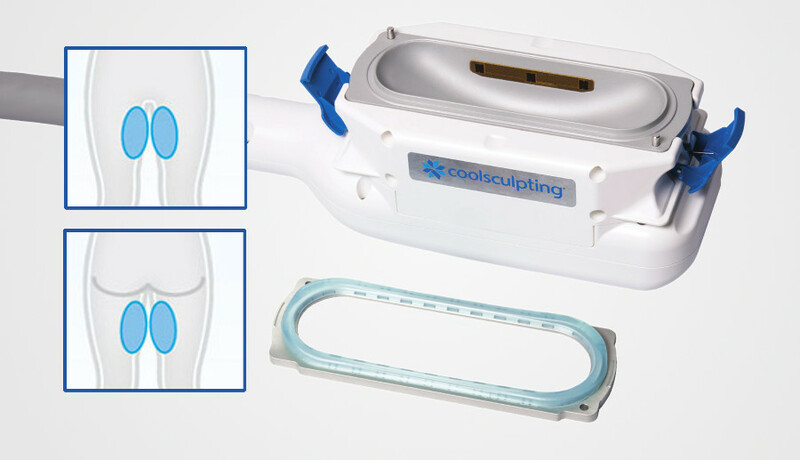 CoolSculpting uses the CoolFit applicator to suction in the fat tissue in the inner thighs. The cooling panels in the applicator will then freeze the fat tissue without harming the skin. One CoolFit session may take from 35 minutes to an hour. At least 4-6 cycles (sessions) are recommended but it will depend on your treatment area and your expectations. Vanquish fat reduction also kills stubborn fat cells by effectively heating the cells to using FDA-cleared Selective Radiofrequency (RF) technology that do not touch the skin. BTL Vanquish body sculpting can be achieved without harming the surrounding skin. The BTL Vanquish Flex works by disrupting fatty cells through the selective heating of adipose (fat) tissue. The process leads to fatty cell shrinkage and elimination in the inner and outer thighs. One session of BTL Vanquish Flex may last at least 30 minutes and can target both inner and outer thigh simultaneously. At least 4 sessions are recommended done weekly for noticeable results. Many of us want to have toned-looking thighs that give us a slimmer, shapely look. To determine if you’re a good candidate for any of the treatments mentioned, please call our skin specialist in Singapore, Dr. Sylvia Ramirez, at the Cutis Laser Clinics.